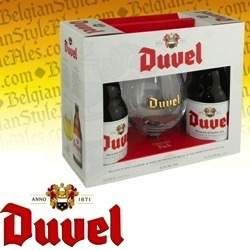 Duvel Gift Set includes two 11.2 oz bottles of Duvel Golden Ale plus one official Duvel Glass Goblet. 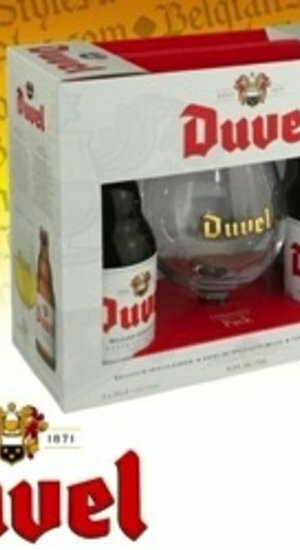 Duvel Gift Set includes two 11.2 oz bottles of Duvel Golden Ale plus one official Duvel Glass Goblet. The flagship of the Duvel Moortgat Brewery, Duvel ("Devil" in English) is a Belgian Strong Ale top fermented with a distinctive yeast strain selected originally in the 1920s and still cultured and used today. Uniquely bottle conditioned in a process that takes three months, the brew is pale golden in color with a full creamy head. Aromas include citrus, apple, bananas and hops with refreshing and robust flavor notes of pale malts, fruity esters and subtle spice. A silky smooth mouth-feel and dry finish help conceal a truly "devilish" 8.5% ABV.